I’m thrilled to introduce my guest blogger today: the talented writer and artist–and just one of the nicest people I know–Nava Atlas. Nava’s cookbooks, from the classic Vegetariana to the more recent Vegan Express and Vegan Soups and Hearty Stews for All Seasons, are known for fresh, inventive recipes that are as easy as they are tasty. I’m happy to be taking the photos for her upcoming holiday cookbook, Vegan Holiday Kitchen, partly because I get a chance to sample so many of her recipes before they hit the press. Here’s a sneak preview of one of the recipes that my family particularly loved. Hello, fellow Susan V. fans! I’m really pleased to be contributing a guest post to this blog, especially as it comes in the throes of a collaboration on my forthcoming book, The Vegan Holiday Kitchen, which will be published in October, 2011. Susan is providing fifty (yes, you read that right) photos for the book, and I’m sure that it won’t come as any surprise to her readers that the ones she submitted so far are absolutely stunning. Whenever I send the latest over to my editor, she says that her lunch looks so pathetic in comparison that she is tempted to toss it. Writing a cookbook often means working on recipes that are out of sync with the seasons, which is not ideal. Fortunately, I’m developing some new summer recipes in real time. It makes me all the more cognizant of keeping cooking to a minimum, and to avoid baking altogether if possible. I think this makes Susan’s job more tolerable as well, since I’m not sending over recipes for her to shoot that require baking a pumpkin for hours or making a long-simmering stew when it’s a hundred degrees out. For the chapter titled Independence Day and Beyond: Summer Entertaining, I’m working on a wide variety of grilled dishes, cold platters, and fruity desserts. Among these are a handful of unusual twists on pasta salad. No throwbacks to the boring, vinegary concoctions of the disco era or the “me decade” that followed, these take their inspiration from ethnic cuisines. Israeli couscous is one fun little pasta. It’s round and quick-cooking, and has a very pleasant mouth feel (look for it in bulk at your health food store if you’ve never tried it). Combined with herbs, raw veggies, and lush stone fruit, it makes for a light and refreshing foil to grilled foods or well-seasoned plant-based protein dishes. It also makes for a lovely dish to share when you’re invited to a summer potluck. 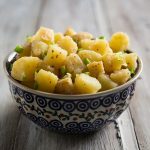 This recipe calls for 3 tablespoons of olive oil, but feel free to cut back, in keeping with the low-fat theme of this blog. In fact, Susan mentioned that for photographing purposes, she likes to keep oil to a minimum. She used only one tablespoon in the dish before shooting it and thought it was fine without adding the rest. I hope you enjoy this preview of The Vegan Holiday Kitchen. If you’d like updates on our progress, I invite you to sign up for my newsletter on my site, VegKitchen, which is currently undergoing a huge overhaul and expansion and being completely veganized. I also invite you to join me on my Facebook page. Make sure to use a firm, flavorful cucumber with a minimum of seeds. Hothouse cucumber is a good choice for this if you can’t get a small, firm variety straight from the garden or farm market. Bring 5 cups of water to a boil in a medium saucepan. Add the Israeli couscous and cook at a rapid simmer for about 8 minutes, or until al dente. Drain and rinse with cool water until the couscous is at room temperature. 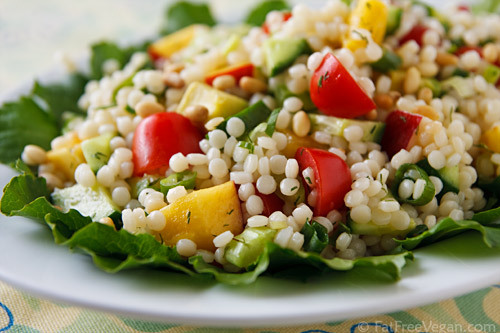 In a mixing bowl, combine the couscous with the remaining ingredients except the last two. Toss well to combine. Line a large serving platter with some greens. Mound the salad over them, letting some of the greens show along the edge. Sprinkle the top with the toasted nuts. Serve at once or cover loosely with plastic wrap and refrigerate until needed. Hi Nava! What a great-looking pilaf. I LOVE the mouthfeel of Israeli couscous — it’s so satisfying to bite down on the chewy little nubbins! Great looking recipe. Wow! That looks absolutely amazing! Does anyone know where I can get this type of couscous in the UK? I have seen it at Trader Joe’s. Whole Foods might have it too. Gorgeous! I love Israeli couscous, and don’t get to eat it nearly often enough. Thanks for this. I just bought some whole wheat “Israeli” couscous (called “maftoul” on this box from the Middle Eastern market) and have been looking for a recipe to use it in – so this is perfect timing! Looks great. Hi Susan`-> We all knew that you were a gifted person and very generous in sharing your recipes so freely. So, it is no surprise and was just a matter of time before an established vegan cookbook author like Nava Atlas would seek you out for your signature collaboration in photography art work design. In fact, your gift of photography and vegan cuisine (among others) would be in demand in other areas as well, i.e., landscape, free roaming animals etc. Regarding couscous, it has dropped in price from $7.99 to $3.99 here in RI and still to pricy in my opinion, considering that this type of grain (semolina) is why I have reduced the amount of our family’s addiction to pasta (white) which we enjoyed heartily before becoming vegan. Since then, I’ve become picky about grains and prefer whole or multigrains, in order to keep carbohydrates to a limit and make room for more untried vegetables while at the same time being more cost conscious (as most of us are these days). Thank you Susan for the wonderful and delicious recipes and your commitment to a vegan lifestyle and have the best summer ever in your garden. Peace Now. Go Vegan. This just looks perfect for summer! I love salads like this but I would have never even thought of adding apricots. Can’t wait to try! The apricots/nectarines absolutely make the dish! Ever since I made it, I keep wanting to put them in salads. Give it a try! Magic words, “…refrigerate until needed.” Bless you. Anything I can do to keep cool as well as last minute dinner prep time is much appreciated. It looks fantastic and I bet it even taste better. And, Nava rocks. Her cookbooks, ‘5 ingredient’ and ‘vegan express’ are staples on my kitchen shelves. Nava, thank you for sharing with us so generously, you are truly a food genius and I can’t wait to buy your new book. Susan, how do you take such wonderful photos? Please share your secrets with us, your food is so beautiful! I had a similar cold salad recently, but this one looks even more delicious! Thanks for sharing! Susan. I’m confused. My husband and I just checked out your blog. We understand your blog to be a vegan only site. Is non vegan photography and recipes now also to be included? This would disappoint those of us who believe veganism is a moral and ethical stand against the unconscionable suffering of non human animals and the use of their bodies and secretions. If we are incorrect, then, please be sure to let us know when you will be publishing your own amazing (we are certain), vegan cookbook. My Sweetie whispered in my ear just now that he would buy it for me as he is confident it is one present that I won’t return. DeeDee, thanks for the complement–a cookbook is in my plans. But I’m really confused by the rest of your comment. All of the photos and recipes on my blog are vegan. 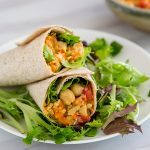 There may be links to non-vegan blogs on my blogroll or from my ad network, but all of the recipes on fatfreevegan.com are vegan. Can you tell me what you’re referring to? Hi Susan`-> My error!!! Gratefully. You Rock. Wow! THat is a beautiful and colorful meal, and exactly the type of food I love to eat! I need to try this one! Its so beautiful!! Lovely colors…a perfect summer dish! That looks SO gorgeous. And, now I’m starving, and it’s not even lunchtime! Could you explain the difference between the box of couscous I can pick up at the local supermarket and Israeli Couscous? Thanks! 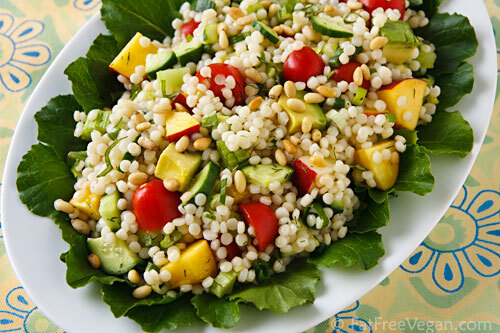 Lori, the Israeli couscous is much larger and is lightly toasted. I have a little bit of info on it–along with a description of Lebanese couscous–on this page. I know if you do a Google search, you can find more details. Caution, fellow vegans: I have discovered that some Israeli couscous contains egg. Greta`->Thank you. In the past I have also been fooled by egg as an undesirable ingredient in pasta, although, I do prefer substituting whole/multgrains in grain dishes. I’m sure it will turn out delicious. Aren’t we lucky to have Susan experiment for us? my family does not like dill. I used cilantro. Loved it! Made this for a party, but I omitted the scallions (I don’t like ’em), avocado (afraid it would turn if the salad was not refrigerated), nuts (didn’t have slivered almonds, and sadly, most pine nuts in our stores seem to come from China now–we don’t like to buy them anymore); added sprouted, baked tofu (just because…), and it was great. 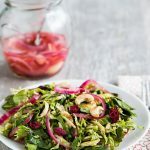 This is a fantastic base for a lovely and unusual summer salad. Interesting looking salad. I am sure it would taste good and be something different for summer. I have never seen nectarines in a salad before but would be keen to give it a go. Thanks for all the lovely comments, everyone! This is one of those projects that’s fun to work on, but it will be even more fun when it’s done, as it’s a considerable amount of work for both of us. Right, Susan? You’ve got the much bigger job, Nava, but yes–I think the best part will be paging through the finished book. Thanks so much for allowing us a sneak peek into it! So colorful and fresh! Perfect summer salad with all things healthy. I love how colorful this is! Looks delicious! This looks so fresh and summery and healthy. Yummy! I’m very new to eating vegan. I’ve switched for health reasons. These same issues require me to be fat free – at least added oil free and no avocados. This salad looks so fantastic. Do you think it would be OK if I totally eliminated the oil? Would I need to increase the lemon juice? Clara, I would just eliminate the oil and add lemon juice to taste. Hope you enjoy it! We’ve made this twice. It was great both times. We were even able to eat left overs stored in the refrigerator. Usually you can’t do that with avocado, but there was no problem with the couscous salad stored in a tight lidded container even though it had both avocado and apricot. I’ve used and treasured the Vegetarian Holiday Cookbook for many years. Like many others I’m waiting eagerly for the Vegan Holiday Cookbook. Nava (I think the name means “beautiful”) has contributed to many beautiful holiday and Shabbat meals. I can’t wait to make this- you can tell by looking at it that it’s going to be delicious! I cannot begin to thank you enough for this recipe. I made it last week for my husband and friends – it was the hit of the evening. I have SO enjoyed your recipes and posts for many months and can’t imagine cooking without you! I made a quinoa pilaf the other evening and I did not season it very much so it was not a big hit. Back to the drawing board on that one. 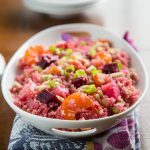 I am looking forward to this recipe, looks like I could use many of these ingredients in my quinoa dish to kick it up some and have my family smile while eating it! 🙂 Sometimes a challenge but a fun one! At least they eat it, right!? Thanks for the ideas and the recipe on Israeli Couscous. What a beautiful and delicious dish! I dove right in and made this dish for guests although I wouldn’t normally do so without trying it first. That being said, EVERYTHING on your website is top notch, the directions easy to follow, and turns out great every time, so I had no fear! Everyone loved it, vegans and non vegans alike, and my husband has requested it for dinner two more times! Looks fantastic. I’m new to this blog but found it since I’m trying to make the switch from veggie to vegan. I’m sure I’ll find lots of great inspiration! Look forward to the Holiday book. Didn’t know about the difference between Israeli couscous and the box – thanks for the info. This is a great light meal for summer! Thanks for sharing. I love this dish and so do all my friends. Is there a fruit substitute that works when nectarines or apricots are not available? Mangoes possibly? Mangoes sound perfect. I think any fruit would be delicious.